London, March 26: A British Airways (BA) flight destined for Dusseldorf in Germany mistakenly landed in Edinburgh, Scotland, after a flight plan paperwork was submitted incorrectly. 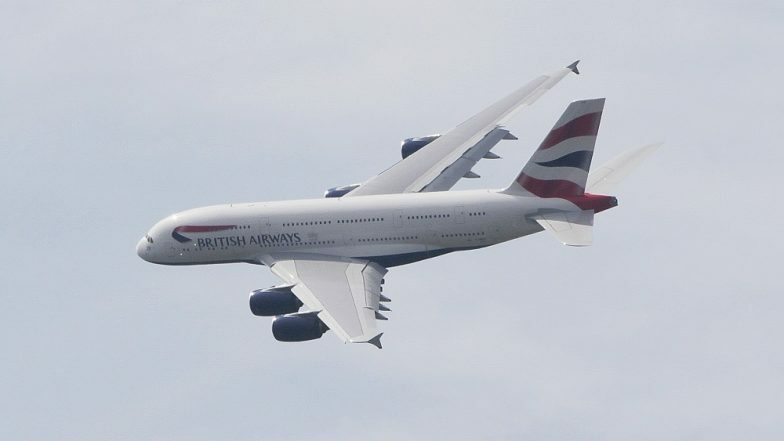 The Times newspaper reported on Tuesday that BA flight 3271 to Dusseldorf left the runway at London City airport on Monday and passengers only realised the error had been made when they heard the "welcome to Edinburgh" announcement after the plane had landed, reports Xinhua news agency. The flight was operated by WDL Aviation, a small German aviation business, on behalf of BA. On Sunday, the plane flew Dusseldorf-London City-Edinburgh-London City-Dusseldorf. It was believed that someone had picked up or emailed the wrong day's flying programme and the mistake wasn't noticed. A BA spokeswoman said the company was working with WDL Aviation to establish why the incorrect flight plan was filed. "We have apologized to customers for this interruption to their journey and will be contacting them all individually," the spokesperson said. British Airways to Launch its Shortest Flight From Bahrain to Dammam. Sophie Cooke, a 24-year-old passenger on the flight, said when the pilot first made the announcement that the plane was about to land in Edinburgh, everyone assumed it was a joke. She asked the cabin crew if they were serious. The pilot then asked passengers to raise their hands if they wanted to go to Dusseldorf. Everyone raised their hands. "The pilot said he had no idea how it had happened. He said it had never happened before and that the crew was trying to work out what we could do," Sophie said. The passengers remained on the plane during its stay at Edinburgh and took off again for its intended destination. They eventually landed in Dusseldorf more than three hours late. Passengers were entitled to 215 British pounds in compensation.